While studying dance in Europe, we performed in various places. We liked the idea of being a singer-songwriter sort of a dancer as something not at all capitalistic, but we knew nothing about choreography. For each performance we decided roughly what each of us would or might do in what order and always titled our performance White Dance. We were young and had a desire to start anew away from our teachers in Japan who were calling their work as the dance of Utter Darkness. 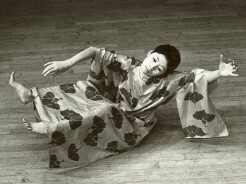 Once, when Eiko was injured, we were ready to stop dancing. “Not until you go to New York,” said Lucas Hoving, a friend and our teacher in the Netherlands. We postponed abandoning Eiko & Koma. When we received an invitation from Beate Gordon to perform at the Japan Society in New York, we made a little more choreographic effort. By our actually deciding on music, costumes and program notes, this White Dance became our first choreographed piece. In 1976, on our way to New York, Irene and Paul Oppenheim, the first people we met in the US, produced an impromptu invitation-only concert in San Francisco, giving us the taste of an American audience. In the following four months in New York City, we performed White Dance at Japan Society, the Cubiculo, two New York libraries, DTW and the Performing Garage. It was through this piece we met many friends, which made us move to New York the following year. Lighting designer Blu helped us even in places that hardly allowed light cues.